Conceived jointly by then Council Commissioner Max I. Silber and Daniel Webster Council Executive Lawrence L. Lee, the museum was engineered into existence as a memorial to Mr. Lee after his death. It was opened in August, 1969, with 1,100 square feet. In less than ten years an addition was required which more than doubled its size to 2,200 square feet. A separate storage-conservancy building was added in 1992. In 2015 the museum moved to its current location on the ground floor of the Camp Carpenter dining hall. 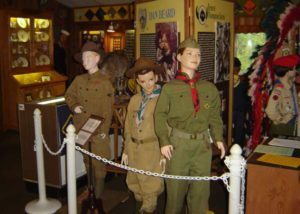 The museum contains colorful and historic exhibits such as Scouts on Stamps from Mafeking to the present, the Joseph Moyer World Jamboree collection, a complete display of Max Silber buckles, original paintings of Boy’s Life covers, and a flag carried to the moon by America’s first astronaut and New Hampshire Scout Alan Shepard. The Baden-Powell display of sketches, letters, and Boer War memorabilia is one of the finest collections of memorabilia of Scouting’s founder anywhere. Extensive exhibits of international items includes the personal collection of Richard T. Lund, former Director of the World Bureau; a complete display of awards donated by Chief Scout Joseph Lawlor of the Catholic Boy Scouts of Ireland upon his visit to the museum, and two beads from the necklace of Zulu Chief Dinizulu which were used in the early Wood badge awards. The library has complete collections of Scouting periodicals, yearbooks, and fiction and non-fiction series of interest to Scouts, Scouters, and researchers alike. A Braille and visually-impaired library of Scout and Cub handbooks is available. The Museum/Library is managed by a volunteer operation committee with the guidance, support, and expertise of an Advisory Board. It is owned and operated by the Daniel Webster Council, Boy Scouts of America. Further information may be obtained by calling the the museum at (603) 965-2845 during operation hours or by contacting the Daniel Webster Council Office at 571 Holt Avenue, Manchester, NH 03109 or telephone (603) 625-6431. Correspondence may be sent directly to: Scouting Museum, Daniel Webster Council, 571 Holt Avenue, Manchester, NH 03109. Our e-mail address is administrator@scoutingmuseum.org. Arrangements can be made for special tours and groups at any time. Admission and parking are free. Picnic tables and lakeside scenery make the Museum / Library an ideal family adventure. Fully heated in winter and air-conditioned in summer, the Museum offers a variety of souvenirs for interested collectors. Camping arrangements can be secured by calling the Daniel Webster Council, B.S.A. in advance. Open most Wednesdays and Saturdays from 10 am to 4 pm, except holiday weekends, mid-August through late-June; and also open on Thursdays from noon to 6 pm when Cub Scout summer camp is in session, (June 23 to August 8, 2019).